Last night at the Oscars, Star Wars: The Force Awakens was shut out, but one of the movie's new stars, Daisy Ridley, was on hand to present one of the awards. While walking the red carpet before the big event, the actress spoke with MTV News, where she dropped a tantalizing tidbit about the upcoming Star Wars: Episode VIII, which is currently in production. Here's what she had to say, revealing that Luke Skywalker is "so cool" in the movie. "Me and Mark (Hamill) have been rehearsing a lot, and it's really amazing. When we went back to Skellig to do that opening of 8, it was so crazy doing that same scene with a different crew of people. But he's amazing to rehearse with and I'm very excited to do the rest of the stuff. It's such a good story, seriously. Luke is so cool in this one, really." Months before Star Wars: The Force Awakens hit theaters in December, Daisy Ridley and Mark Hamill reunited on Skellig Michael Island in Ireland, to shoot the opening scene of Star Wars: Episode VIII, which takes place immediately after the ending of Star Wars: The Force Awakens. Skellig Michael Island was used to film the ancient Jedi temple that Luke Skywalker was hiding at, which we finally saw in the final scene. When production started in earnest earlier this month, LucasFilm released a video teasing this opening scene, although we still don't know much about the plot. Star Wars: The Force Awakens cast members Mark Hamill (Luke Skywalker), Carrie Fisher (Leia Organa), Adam Driver (Kylo Ren), Daisy Ridley (Rey), John Boyega (Finn), Oscar Isaac (Poe Dameron), Lupita Nyong'o (Maz Kanata), Domhnall Gleeson (General Hux), Anthony Daniels (C-3PO), Gwendoline Christie (Captain Phasma) and Andy Serkis (Supreme Leader Snoke) are returning to reprise their roles in the sequel. New cast members will include Academy Award winner Benicio Del Toro, Academy Award nominee Laura Dern, and talented newcomer Kelly Marie Tran. Unfortunately, no details have been given regarding the characters these new cast members are playing. In related news, Twitter user Tim Veekhoven revealed a new Topps sticker, which features a new images of Mark Hamill as Luke Skywalker in his now-iconic Jedi robes from Star Wars: The Force Awakens. Disney and LucasFilm didn't reveal much in terms of official plot details while Star Wars: The Force Awakens was in production, and it doesn't seem they'll reveal too much about Star Wars: Episode VIII either. 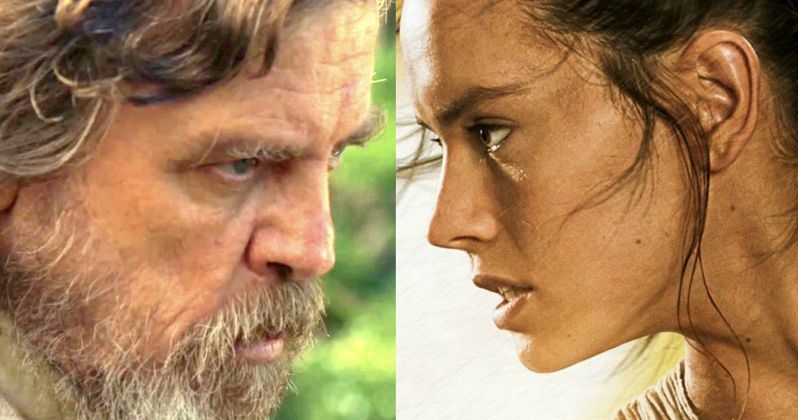 While we wait for any details to surface, check out Daisy Ridley's Oscar red carpet interview below, along with the new Luke Skywalker image.